David Hickman, Stourbridge’s retired chief librarian and well known local historian, will give an illustrated talk about the Stourbridge Canal. The towpath journey, along a waterway cut in the 1770s, includes the ‘Stourbridge 16’ – a set of locks passing through the famous glass quarter and over looked by the Red House Glass Cone. As usual visitors are invited to come along - admission £1. Full membership of the Society costs £4 per year and gives free access to the programme of talks. Bells in Sedgley Manor never measured up to ‘Great Paul’, St. Paul’s Cathedral monster weighing 37,483 pounds - the largest in the land. Locally the bells in churches, chapels and schools were quite modest. Name the building and village. Teaser watchers had their eyes well peeled for bells towers with lots of correct answers. 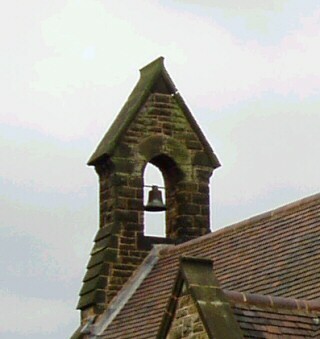 Gospel End’s Victorian mission church of St. Barnabas also acted as a C19th school making this bell a rare dual-purpose ringer. Now silent, it tops a private residence.